Niki Alling's Blog: Happy Independence Day! Author Niki Alling - books, designs and poetry for all ages. This year to celebrate Independence day, I'm going to do it by celebrating Independent Authors and Artists everywhere! This is a fabulous time to be a writer or designer/artist or any other kind of creative person. Being able to self publish has given authors the chance to not only express themselves, but the possibility of making a living or even supplemental income, that they may not have been able to do before. Along with ebooks and POD's for printed books, as with Amazon, Barnes & Noble and CreateSpace. And many products and gifts, through Cafepress and Zazzle, and Etzy, authors and artists are being heard and seen and discovered. Those are just a few of the companies that can be found on the internet. How wonderful to have the freedom to do that. 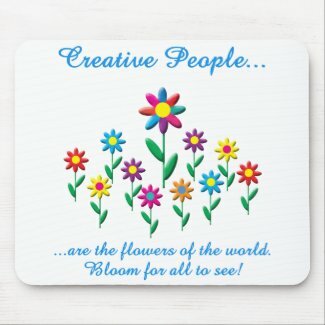 Creative people are the flowers of the world...and we are in full bloom! Happy Independence Day! Create a custom mouse mat on zazzle. Birthday Gifts for Every Day! Great Site for Pre-K Ideas! Niki Alling is an author/poet/designer - she writes for children and adults alike. She has worked as a Preschool paraprofessional for over 14 years and is a mother and grandmother. She holds a Bachelors degree in Graphic Design and she designs and writes poetry for gifts at NikiClix Creations various online shops. Her books cover a wide variety of subjects.